Instant elegance! Well, almost instant. 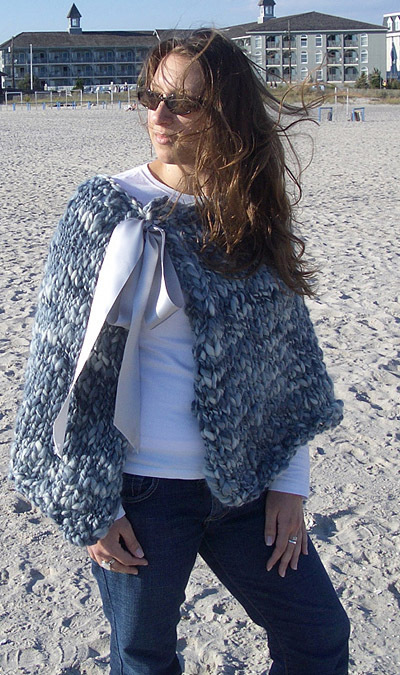 This cape can be knit in the morning and worn in the evening! Wear it to dress up a simple sweaterdress or add a touch of elegance to a t-shirt and jeans. An alternative to the poncho, this downy soft cape not only provides plenty of freedom of movement, but, worn with the bow to one side, the cape's pointed front edge creates a welcome optical illusion: a slimming line from neck to waist that flatters any shape. Now, who can argue with that? The moss stitch hem prevents the roll-up that may sometimes occur from stockinette stitch on its own. The satin ribbons may be tied together directly or woven through the knitted fabric as necessary and then tied together in order to adjust the width of the neckline to suit the wearer. And oh! The name? The cape made its first public debut for this photo shoot on the shores of a quaint Victorian seaside town called -- you guessed it -- Cape May. Note: While I would not normally recommend knitting to the very end of a ball in the middle of a row and tying the old yarn to the beginning of a new ball, in this case, I would suggest precisely that. Otherwise, you may find that you'll need an additional 2 or even 3 balls to complete the cape. 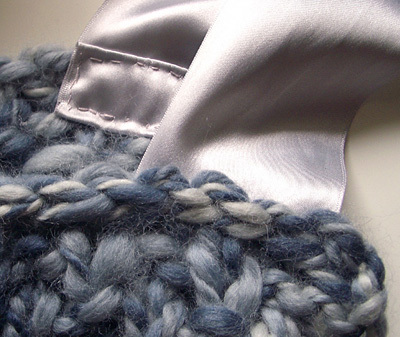 The garter stitch edging on either side of the cape would also look neater without loose ends woven in. So when you reach the end of a ball in the middle of a row, I suggest joining it to the next ball of yarn with a square knot (ie. left over right, then right over left), leaving about 5-6 inch ends to weave into the garment once it has been completed. Row 1 [RS]: K2, [k1, p1] to last 2 sts, k2. Row 2 [WS]: K2, [p1, k1] to last 2 sts, k2. Row 3 [RS]: K to end. Row 4 [WS]: K2, p to last 2 sts, k2. Rep Rows 3 and 4 until work measures approx 10 inches, ending with a WS row. Next Row [RS]: K2, k2tog, k to last 4 sts, k2tog, k2. Next Row [WS]: K2, p to last 2 sts, k2. Work these 2 rows 8 times more. 52 sts rem. Work 5 rows in patt as set. Work these 2 rows two times more. 62 sts rem. Next row [RS]: K2, k2 tog, [p1,k1] to last 4 sts, p2tog, k2. Next row: K2, [p1, k1] to last 2 sts, k2. 48 sts rem. Use crochet hook to weave in ends. Cut satin ribbon in half. At the end of one length of ribbon, fold under 1 inch of the fabric and secure with pins to the wrong side of the top left corner of the cape's neckline. Repeat with the other ribbon length for the top right corner of the cape's neckline. Using photos as guides, sew a one-inch rectangle across the pinned and folded edge of each ribbon, to secure the ribbon behind the neckline. Then sew over the same rectangle once again, taking care not to let the sewing stitches show through on the front side of the garment. Cut the loose end of each ribbon at an angle. 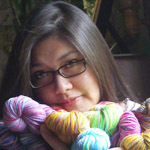 Axelle de Sauveterre is a corporate executive who has been knitting for over 15 years. In her spare time she enjoys handpainting yarn, and some of her projects have been been sold to galleries in and around New York City. yarns] can be found on her blog, Two Pointy Sticks.